We’re excited to be sending Curt off to the UK for a week of clinics, school visits, shop visits and maybe even a trip to Stonehenge, just to check in with the saxophone maker spirit! In this short 1.5-hour clinic, Curt will share his philosophy of instrument repair along with some of the tools and techniques he uses in his shop in the USA. The event is Free for NAMIR members! Guests are welcome to attend! For more information CLICK HERE! In this clinic, Curt will walk you through the two parts of a saxophone overhaul. The mechanical restoration and the aural overhaul. You will learn and understand the procedures necessary to create a machine that plays without mechanical limitations. This includes techniques for fitting keys, necks, leveling pads, pad cups, material choice pad choice and more. 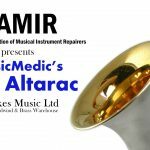 You will be taken through the procedures used at the MusicMedic.com Sax ProShop and will gain an understanding of the proper chronological order necessary to properly overhaul any saxophone. 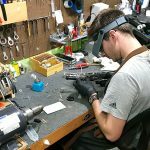 Many of the techniques employed at the ProShop will save your shop time and money while producing superior and consistent results. Once an instrument is mechanically sound, there is still a lot of work to do. Curt will explain his techniques for Tuning and Toning saxophones as well as other procedures involved in making the instrument sound its best. This discussion will include, key height set up using Curt’s Balanced venting method, Play Testing and Play Trusting, Tuning, Toning, the use of bore, neck and tone hole liners and other tuning techniques. Curt will discuss practical implementations of his techniques and his acoustical modifications during the finishing stages of a MusicMedic.com Sax ProShop Uberhaul. This event is also free, for more information CLICK HERE! After a day of clinic rest, Curt will head to Newark to visit the School of Musical Instrument Craft at Newark College on November 7th. He’ll be meeting and talking with students there and hopefully inspire a few new future makers and techs! And that’s just the beginning! If you’re in the area and you would like to attend any of these events, please feel free to reach out! Also, if you would like Curt to visit your shop or just get together for a Pint feel free to contact us and we can set everything up!